Today’s highlight item is a random find on a clearance rack— a velvet jumpsuit from Rainbows. Let’s see how I turned it out. Since there are the faintest hints of fall in the air, I decided to do light layering with all three looks. For this first look, I took a print wrap dress and kept it open over the jumpsuit. It’s naturally knotted in the middle, so if you want to replicate, tie at the appropriate place for your body type. If you’re an apple shape, aim lower past your belly; a licorice shape, try knotting to the side. What I also love about this look is that the texture and print play off of each other. The texture breaks up the print for the eye and vice versa. Neither print is too in your face but together, the visual is more striking. Try looking for a jumpsuit in a jersey/lycra mix for a snug but not tight fit. The second look plays with proportions and by doing so, re-emphasized my distinct waist to hip ratio. If you are slimmer in the hips, try a billowy kimono style wrap over a fitted under layer. It will add volume without adding bulk. There IS a difference. The volume right above your slimmer hips will give a curvier look. I tried a splash of trendy for the third look with great results. As you know, I’m not the biggest fan of floral print or mesh. But in an effort to stretch myself, I picked a floral mesh duster and it’s my newest fave. It provides arm coverage without adding heat. It breathes and understated texture on texture on texture makes it look almost like a moving painting. I added some banging orange earrings that offer a crisp pop of color to the overall dark-colored look. It lifts the whole thing and I maaaaay be warming up to the idea of more florals and mesh. It's been a while since the last 3WTS, so why not bring it back EGC style with a great staple piece in green? Where do I begin with this green maxi dress? It's so roomy, comfy and versatile for any closet. If you have a larger tummy, RUN AND GET THIS DRESS IN EVERY COLOR. If your weight fluctuates, RUN AND GET THIS DRESS IN EVERY COLOR. If you want a simple, cute staple, RUN AND GET THIS DRESS IN EVERY COLOR. I guess what I'm trying to say is RUN AND GET THIS DRESS IN EVERY COLOR.lol. Seriously, the fabric is very stretchy and flattering to virtually every size and body type. Keep scrolling to see how I styled it. I decided to go slightly glam with this look. I kept my waist defined with a standard belt and decided to keep the style top heavy. A faux fur is a simple way to glam up any look. This particular one is meant to be worn as a collar. I wrapped it at a diagonal because to show the way you can pair it with a necklace and/or head wrap. Going heavier on accessories on top is great if you have a smaller bust or fuller hips. If you have a trouble finding longer tops, try a stretchy maxi dress. You can know it at the side like I've done here. That way you can adjust the dress to you needs. I love this option for my divas wit long torsos and or bigger tummies. You can make the "top, high low, crop top or any other style. Let your imagination run wild. The only pairing possible for such a striking green was an equivalent counterpart. This time I went with one of my favorite prints from Eloquii. (My favorite store ever). I like the vibrancy of the print and how it compliments the deep toned green so well.Try a bright print/deep solid combo to spice up your closet. Last , but least, is this look. I decided to keep it simple. Simple doesn't mean boring. The quickest way to make something go from Blah to BAM is an opulent statement necklace. You can never go wrong with pearls, so I chose a pearl necklace that can't be missed. Opt for an undo hairstyle to take this look up another notch. Are you in love with the dress yet? I'm telling you, you need this dress in your life, it really is as great as I'm making it out to be. Which look was your favorite? Let me know in the comments below. I looooooooove print as much as the next girl. But loving them and wearing them are two different things. I wear them often, but many women are too scared. The usual reasons? It will create too much attention; they don't know how to wear them. This installment of 3 ways to Slay (#3W2S) shows me taking the challenge head on while being a kid again on the playground. 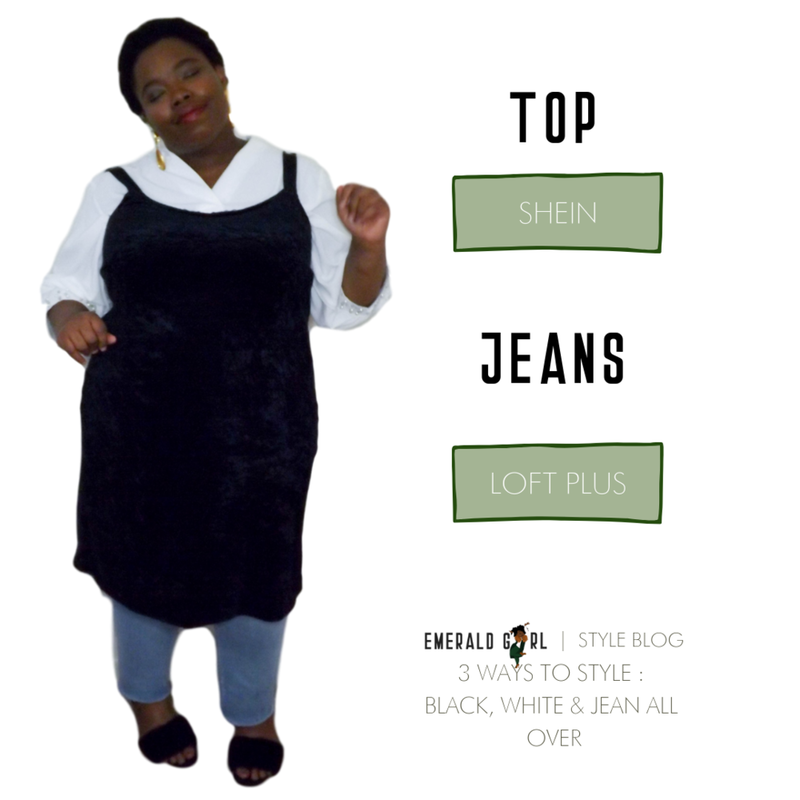 You KNOW I love Eloquii and as usual, they are highlighted in this lookbook. I would suggest them for bold prints you won't find anywhere else. Keep scrolling for pics and Link details. These pants give a fun take on the classic leopard print. If you are a little timid about bolder pieces, choose a standard print (stripe, leopard, polka dot) in an atypical color. This not only allows you to be more comfortable with brighter colors, but it makes a bold impression. And bold's the whole point, right? Most people pair something bold with a basic black or white. That is definitely a great start. If you would like to "cut" your print, I say add another color. In this instance, it was a deeper royal blue. I actually stole this button up from my husband's side of the closet.lol. I like to wear men's button ups because they tend to have more structure and made with thicker fabrics. I simply tie it up to keep the fun of the look consistent. If you want some button ups, try the men's section. You'll thank yourself later. Let me be honest. This outfit was a complete accident. XD I was changing clothes and my husband/photographer simply said "Hey! That works!" Voila-- a look was born. Mixing prints are the last frontier in my style journey. I admittedly was timid about approaching it, but in the last few months have been cultivating my approach to mixing print in a way that was indicative of me. It's a true process and on the other side, I will share full details. Just know that now, I am copy with mixing prints and that there is no one right way to do it. Try it yourself. Don't ask if it looks right;simply ask if you like it and go. This particular pairing works because of it's complimentary color scheme. Different prints work together for different reasons. Try and experiment this week and see what you some up with. When it comes to this print, I like to play it up and down. This fun print is perfect for someone wanting to try something new. If you want to go outside of basics, go geometric. A triangular or square pattern may be easier to style for you because of its inherent symmetry. I decided to dress down this top with THE BEST LEGGINGS ON THE PLANET.lol. That was a bit much, but I stand by these leggings being the most solid, non opaque, warm, stretchy leggings you will find anywhere. A strongly recommended item for your wardrobe. In this look, the leggings play supporting actor just enough to take a usual dressy top and makes it casual fun. I chose flat shoes, but it you want a more flirty casual look, wear some pumps or sandals. The simplest edit can change this entire look. That's the beauty of a bold print. Which outfit was your favorite? Let me know in the comments below. Try wearing a bold print this week. If you do, send it to contact@egchronicles.com or post it on social media using the hashtag #3W2S. Can't wait to see what you try. The word basic has taken on a few negative connotations in the last few years. One of its implications is that its underwhelming. I believe the definition needs to be redefined. Basic for me is equivalent to essential. Essential pieces are building blocks to crafted a style all your own. Style is all about balance. Overstated paired with understated; bright and bold with muted and classic. Balance comes in opposites. To prove this point I'm releasing another installment of 3 ways to slay centered around a "basic" top. This particular top comes from JC Penny and it is definitely an affordable essential. 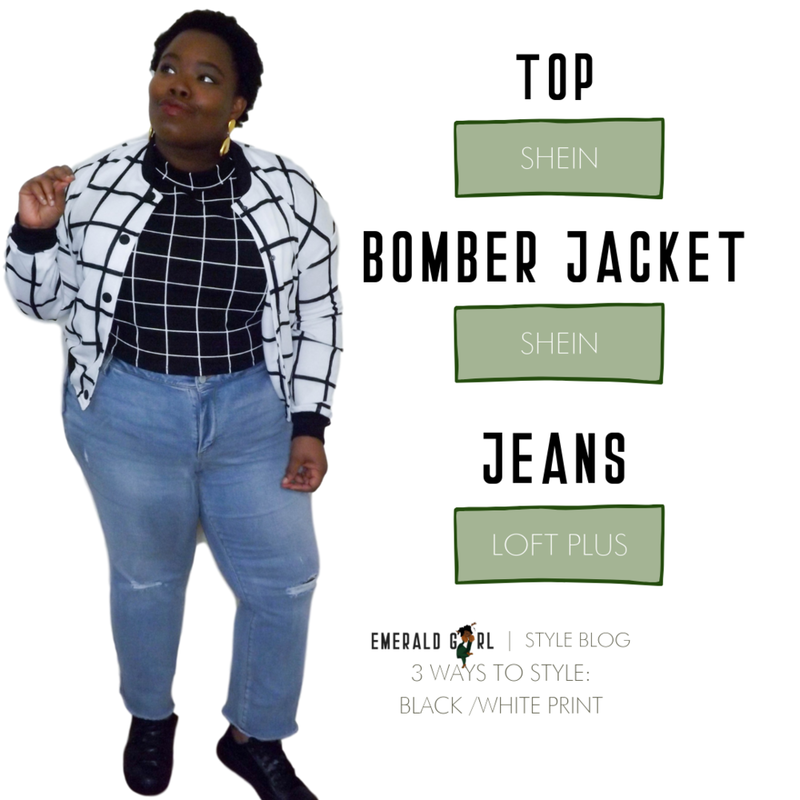 The 3 looks include pieces from Eloquii to show you how to combine trendy with basics. Eloquii is fast becoming the go to store for trendy chic womenswear. 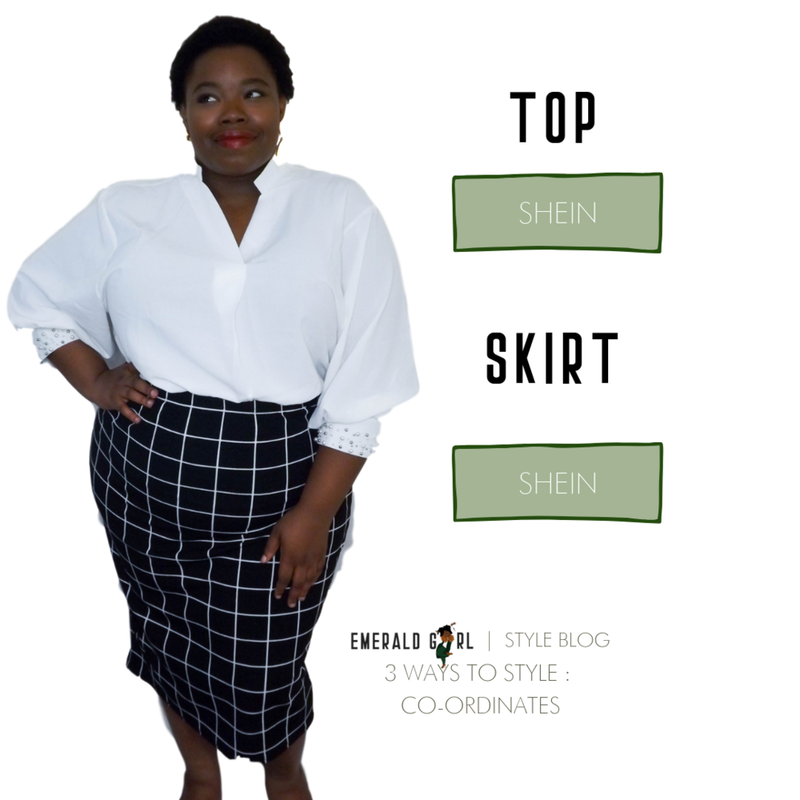 The three looks highlight Eloquii with my "basic" clothing option to give you the idea of how to maximize the style potential of basics. Remember-- Balance is key. Keep scrolling for outfit details. I love to take flashy trendy items and "dress them down". The basic top and the chambray make the skirt more casual. It's the perfect way to spice up everyday wear without giving up trends or one's personal style. If I want a little more fun, tie the button up like a crop top. It makes the look just a bit more flirty. If you want to switch up more, change shoes. What a difference a shoe makes, right? The pencil skirt is a classic cut. I opted for this vibrant green to pair with the basic top. It's still classic but in an atypical color. My tip for this look is to try orange, green or lighter shades of purple skirts if you can find it. It will breathe new life into your basics and spark some creativity in your daily choices. You know I'm a sucker for a statement necklace, so I chose smartly. I used lighter shades of green and blue to add a pop of color on top of color. It's the easiest way to break up monotony in a color block look if you need more. The best thing about a poncho is that it covers like a jacket and is free like a scarf. I love its flexibility. The only downside is that it may move as much as you do and fall off. I simply put a thin tie around it at my waist. It not only helps the poncho stay stationary, but its also a extra detail that ties your look together. Hopefully each look inspires you to put more faith into your basics by incorporating them more and more into your looks. Winter is in full effect, and so is my style. Another 3 ways to slay installment is overdue and I'm excited to start layering like a boss. This is the season that tests all the styling tools in your arsenal. Sometimes you get in a style rut and just start wearing the same thing over and over again. It happens to everyone. I like to window shop to keep my inspiration fresh. I also like to see how other people style themselves because we can al learn from one another. This 3 ways to slay installment came when I realized that I had not seen a lot of people style maxi items. It was trickier than I had anticipated. You're covered from head to toe and the usual leg real estate is already covered. You don't want to add on too much bulk and run the risk of feeling constricted. But it is winter and you do need layers for warmth. Before I started to freak out, I took a step back and realized that I needed to take my own advice.I stopped thinking too hard and went back to basics. Add on my foundational thermals and style as usual. Voila! If you need some styling inspiration, keep scrolling. Pics and buying links will be included. The minimal maxi dress is divine. I chose to keep it simple by adding a pop of color with my blazer. To add an extra level of chic, I turned a small infinity scarf into a headband. It will also keep my ears toasty. This maxi dress is perfect for a cute casual look. I wanted to incorporate classic and trendy styles, so I opted for a striped off the shoulder top. Olive and blue is a classic color combo, so I added a neutral scarf so I won't take away form the whole ensemble. I hate the style rule that prohibits the gold/silver pairing. I think this cool toned grey is perfectly styles with gold accents. You can also choose to a slender gold necklace or a pair of gold hoops. I'M BACK AGAIN WITH ANOTHER INSTALLMENT OF "3 WAYS TO SLAY." THIS TIME AROUND, WE TACKLE ANOTHER BASIC- THE LONG SLEEVES WHITE SHIRT. I REQUIRE AT LEAST 3-4 IN MY WARDROBE AT ALL TIMES. THEY ARE SIMPLE, CLEAN, TIMELESS AND SOOOOO VERSATILE. IT'S REALLY HARD TO GO WRONG WITH A LONG SLEEVED WHITE SHIRT AND I HOPE THIS POST GIVES YOU SOME NEW IDEAS FOR MAXIMUM STYLE WITH MINIMUM EFFORT. SCROLL FOR LINKS AND PRO TIPS. PRO TIP: ADD TEXTURE TO A STAPLE PIECE LIKE A WHITE TOP. TRY FAUX FUR, CORDOROY, OR A KNIT PIECE. PRO TIP: IF IT AIN'T BROKE, DON'T FIX IT. A CRISP WHITE TOP, BLUE JEANS AND BLACK FLATS WILL NEVER GO OUT OF STYLE. A GREAT GO TO OPTION. PROTIP: FILL IN THE CUTOUT PARTS OF YOUR CUTOUT DRESSES. IT ADDS DIMENSION AND ALLOWS PIECES USUALLY WORN IN WARM WEATHER TO BECOME TRANSITION PIECES. I am admittedly not an authority on how to expertly wear print. 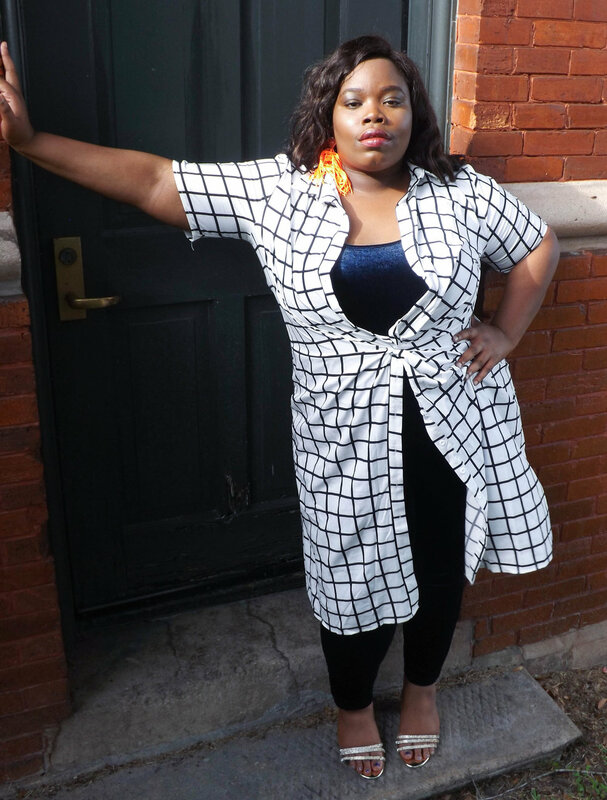 It took me a long time into my own fashion journey to drop the "big girls can't wear big prints" myth. Sure I wore a print here and there, but I never tried anything quite daring or unique. So glad I'm over that ridiculous point in my life.lol. I am now on a mission to embrace print completely and master print mixing in the near future. 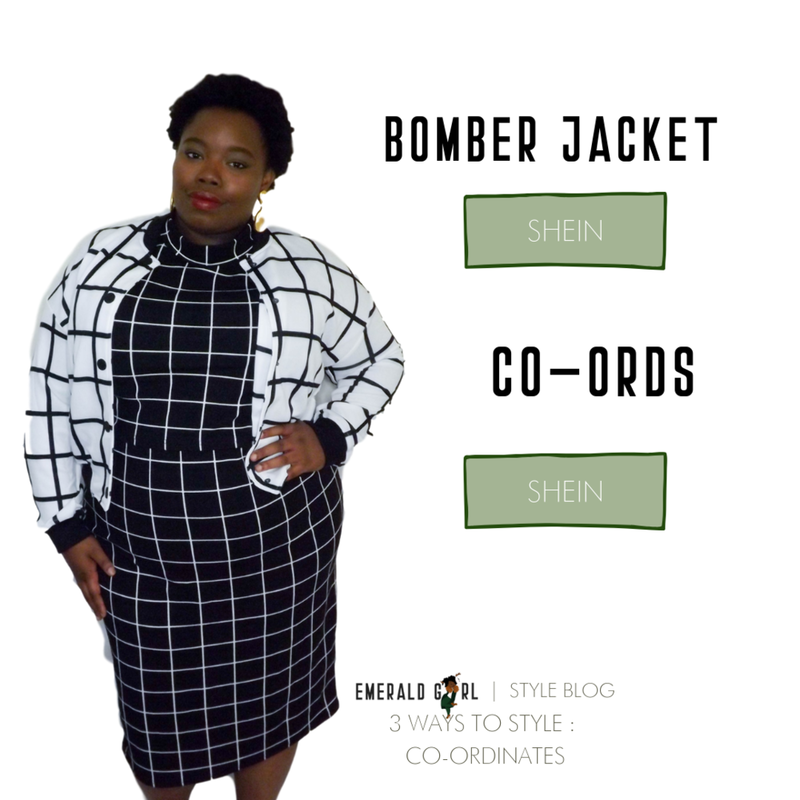 This 3 ways to slay installment will hopefully help you embrace more prints and patterns within your wardrobe. Let's grow together. Scroll for outfit details ad links. PRO TIP: WHEN CHOOSING PRINT, TRY AN ABSTRACT PRINT. WHEN COMBINED WITH THE RIGHT CUT, IT CAN HAVE THE SAME EFFECT AS RUCHING. PRO TIP: PICK A TRADITIONAL PRINT LIKE PIN STRIPES IN NON TRADITIONAL COLORS. FOR MORE OF A WOW FACTOR, FIND IT IN A JUMPSUIT. I want to help everyone use every item in their closet to their maximum potential. This includes basics and statement pieces alike. After viewing a video by Jarel Jonesx TV (vid here ), I decided to do my own version and the "3 Ways to Slay" Series was born. I intend to show you the versatility of common pieces in your wardrobe. Whether minimal or extravagant, the 3 Ways to Slay series will give you inspiration to try new things with old items collecting dust in your closet. First up : leggings. Leggings are a staple in many a wardrobe. But all leggings are NOT created equal. My absolute favorites are from Eloquii.com. They are thick, durable most importantly, comfy. I have created 3 looks around these heavenly leggings. Scroll for pics and details. PRO TIP: TRY A PRINT IN UNEXPECTED HUES. IT KEEPS THE EYE LOOKING EVENLY THROUGHOUT THE SILHOUETTE, MINIMIZING FOCUS ON ANY PARTICULAR AREA. PRO TIP: CONTRAST THE SLIM, CLOSE PROPORTIONS WITH LARGE TOPS AND ACCESSORIES. IT WILL LENGTHEN THE LOOK OF THE LEG WITHOUT ADDING UNNECESSARY BULK. PRO TIP: WEAR CASUAL SHOES WITH AN ELEVATED CASUAL OUTFIT FOR A "CASUAL CHIC" EFFECT. IF YOU NEED TO GLAM IT UP WITH LITTLE TO NO TIME, ADD A KITTEN HEEL.